Did you know that, prior to Spanish colonization of Mexico in the 16th century, the Day of the Dead celebration took place at the beginning of summer? Then, gradually, it began to be associated with October 31, November 1 and November 2, in order to coincide with the Western Christian triduum of Allhallowtide: All Saints' Eve, All Saints' Day, and All Souls' Day (a.k.a, Halloween). Which is kind of lame! Because even though we love Halloween, Day of the Dead gatherings and celebrations are so cool and unique - traditions connected with the holiday include building private altars called ofrendas, honoring the deceased using calaveras, aztec marigolds, and the favorite foods and beverages of the departed, and then visiting graves with these as gifts - that they deserve to stand all on their own. 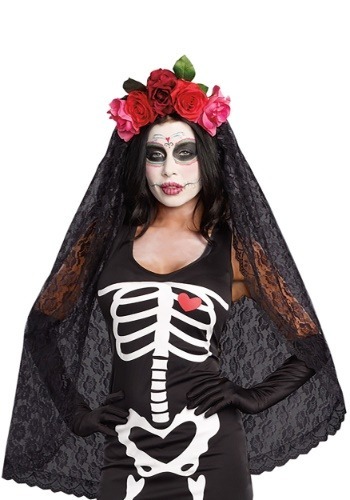 Which is also why we absolutely love this Women's Day of the Dead Headpiece. The black lace veil with 5 fabric roses attached so beautiful and amazing that there's no mistaking just what kind of celebration it represents. Pair it with traditional facepaint and a gorgeous black gown and you'll be the eternal queen of every festival you attend! Love this looks great can't wait to put it all together !